Are you ever in the process of buying something and think to yourself, "I could make that for way less." This year I decided to put my money where my mouth was and make my own. 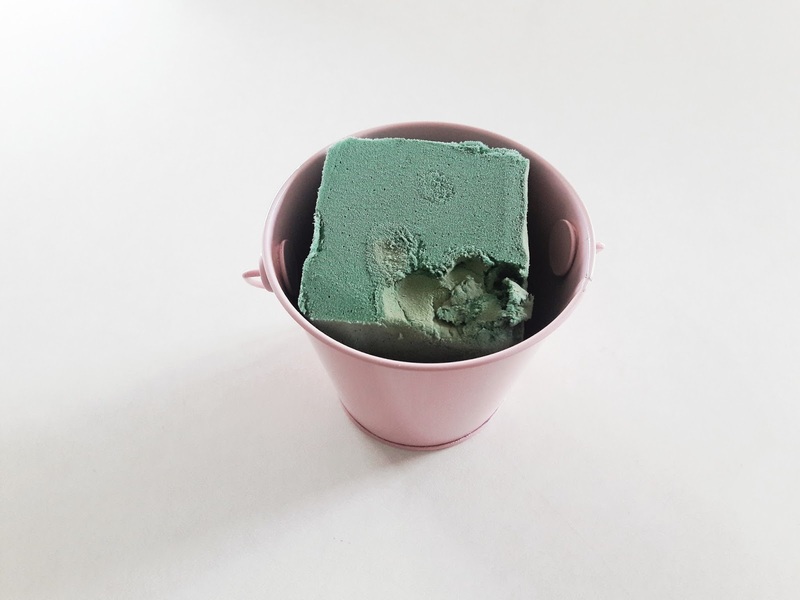 Cut down your floral foam to fit inside your choice of base. My bins tapered in towards the bottom so I had to cut them at an angle. I used dollar bins from Target but you can use whatever works for you. I have seen people use vases, boxes and even hollowed out fruit! 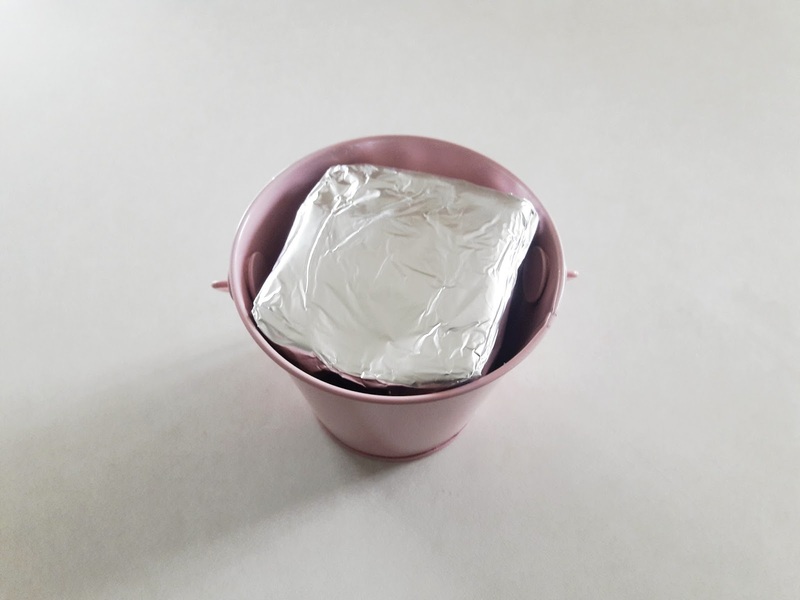 Wrap the floral foam in aluminum foil, this protects the fruit from coming into contact with it. Cover the aluminum foil with cabbage leaves. This step is optional, but it looks more like a store bought bouquet and covers the bright and shiny aluminum foil. To create your pineapple flowers, cut the bottom and top off of your pineapple. Turn the pineapple on its side and cut the remainder into half inch disks. Lay your disks flat and center the cookie cutter on top. Press down and cut the pineapple into the shape you prefer. 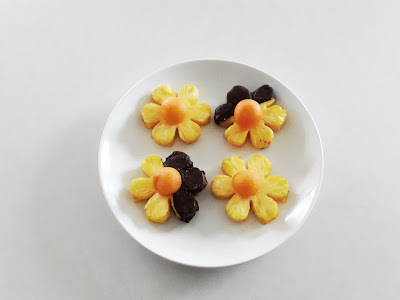 I used a flower but you can do a heart, star or even letters. At this time dip the pineapple slices into melted chocolate if you desire. Once the chocolate has dried, work the top of a wooden skewer through the middle of the pineapple about a quarter of an inch. Be careful not to poke your fingers! Cut your cantaloupe in half, stem to stem. Remove seeds from the middle. Using your melon baller create cantaloupe balls by pushing the melon baller into the cantaloupe down and around. To get mine to lay flat I cut them in half and placed one half on the top of the wooden skewer point we worked through the pineapple. 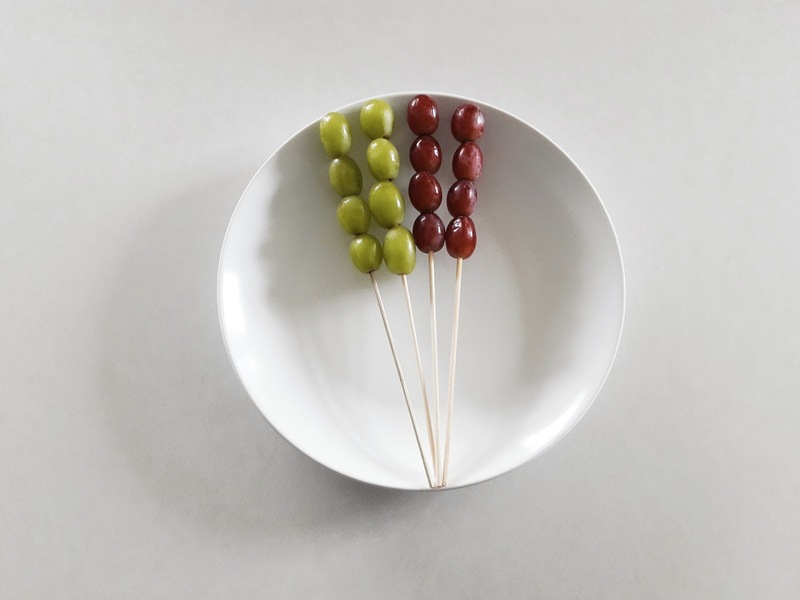 To create the grape skewers, wash and dry your grapes. Remove the grapes from their stem. Work a wooden skewer through the bottom to the top of the grape and move down the skewer. Repeat until you have a few grapes stacked upon one another. You can stack as many grapes as you prefer, just make sure not to work the skewer all the way through your final grape. To create the honeydew skewers, cut the honeydew in half, stem to stem. Remove the seeds from the center of the honeydew. Cut each half of the honeydew into sixteenths. 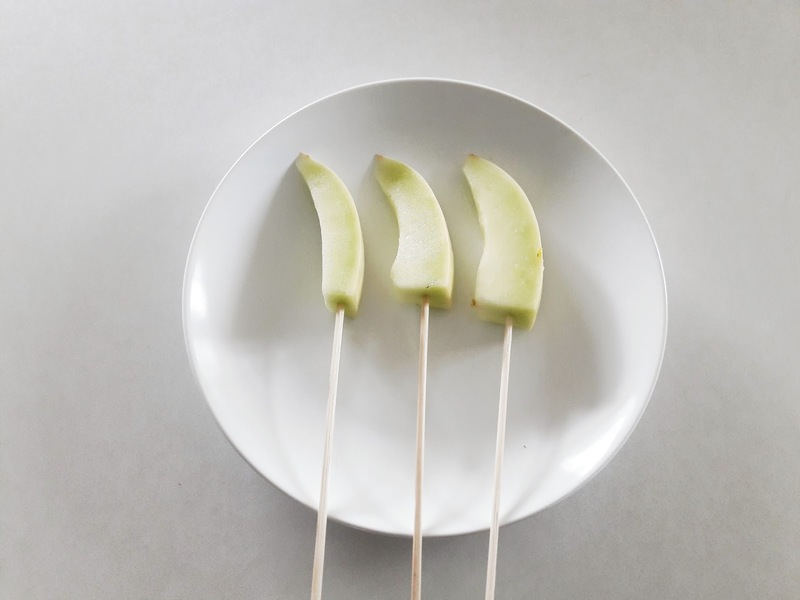 Work a wooden skewer into the flat end of the honeydew slice until it is secure in the middle of the fruit. To create the apple skewers, wash and dry the apples. Cut the apples into eighths. 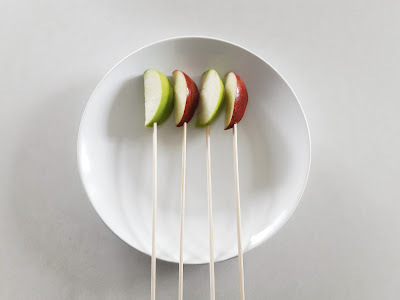 Work a wooden skewer into the end of the apple until it is secure in the middle of the fruit. To create the strawberry skewers, wash and dry the strawberries. 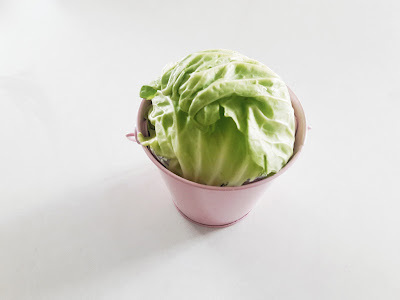 Cut the stem off of the top. 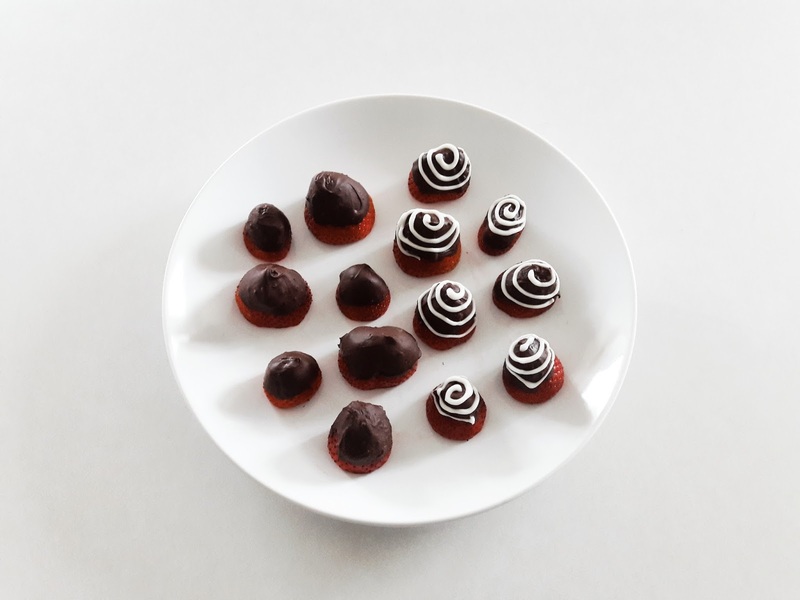 At this time, if you'd like chocolate covered strawberries, dip the strawberries into your choice of melted chocolate. I used dark chocolate as my base. Once the chocolate is dry, select another chocolate to melt, I used white chocolate, and place into a piping bag. Cut a small hole at the tip of the piping bag. Starting at the top of the strawberry work your way around and create a swirl design. 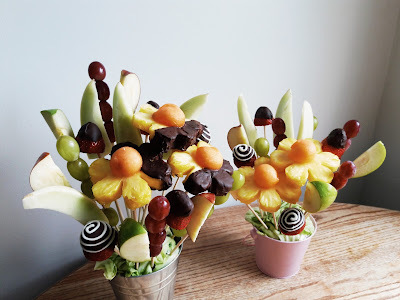 Once the chocolate is dry, work a wooden skewer into the the middle of the strawberry. Be careful not to break through the top! 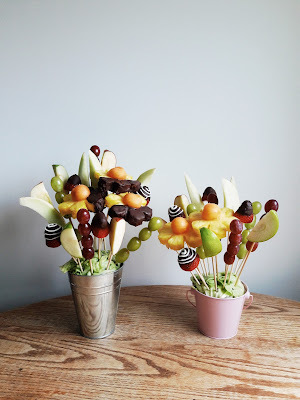 Work your finished fruit skewers into the floral foam until you have arranged them in a design you like. I tried to create layers by placing the fruit skewers up front deeper into the floral foam than the skewers at the back. 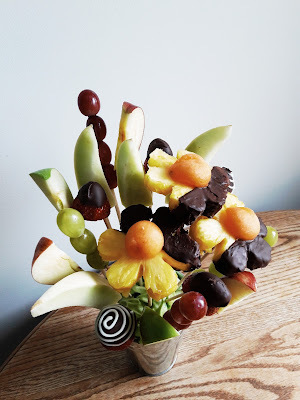 I used two different sized bins to create a large and small fruit bouquet. The larger bouquet will be for my mother. The smaller bouquets will be for my sisters. 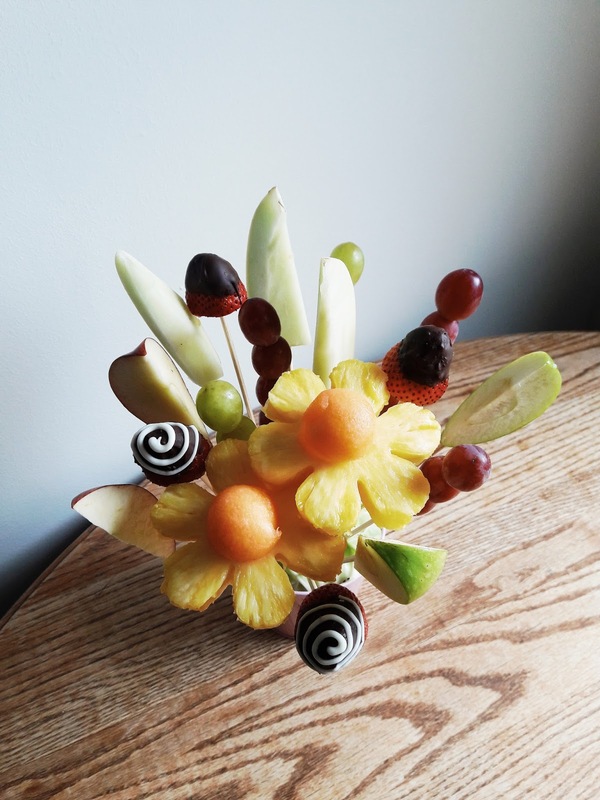 To ensure the fruit would last until I could gift my bouquets I added a little lemon juice to them once they were arranged. I feel like these turned out pretty good for being homemade and I think my mom and sisters will really enjoy them. All together the fruit cost under $30 dollars to make five bouquets! That's what I call a steal. What are you giving to the ladies in your life this Mother's Day?